We're challenging you to beat our step count! 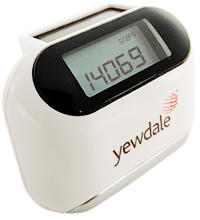 Each & every member of the Yewdale team will be recording their steps and competing to see who can record the most activity during the week. Can you beat us!? All you need to do is record how many steps you manage to do in a day and send us a picture of you with your pedometer score! Either email us at enquiries@yewdale.co.uk or tag and share us on social media to enter. Why not send us a pic of your craziest method to increase your step count? *Challenge commences on Friday 18th and finishes on 25th March. Maximum photo quantity of 1 per person per day.